Another of the potential parasitic betta diseases is Velvet. As with Ick, it is easily prevented with regular inclusion of aquarium salt in tank water. It is also highly contagious. Signs of itchiness are present with Velvet as with Ick, however, the main difference lies in the appearance of the sick betta. Instead of white spots, it will have an appearance of rusty, gold, or coppery dust sprinkled over its body. This is more readily apparent when a flashlight is directed at the sick fish. When one fish has Velvet, the entire tank is at risk, and so it should be treated. Either drain the tank and rinse it thoroughly after washing it in a solution of copper sulphate, or use a product such as BettaZing. Popeye can be one of the more disturbing of betta fish diseases to witness. A condition caused by unclean tank conditions, this disfiguring betta disease can also be symptomatic of deeper underlying causes such as tuberculosis, in which case the result is fatal. As its name suggests, the main symptom of popeye is the bulging out of one or both of the sick betta’s eyes. Within a week, this can be so grotesque as to seem incurable, but full recovery is still possible if the underlying cause is not terminal. When caught early, it can often be healed with aggressive treatment. A full water change is the first step and during treatment, the water should be kept as clean as possible, with additional changes every three days. Ampicillin, an antibiotic, should be added to the water of the sick betta. This should be continued for a week after the betta’s eyes return to normal to ensure thorough wellness. One of the more common betta fish diseases is Dropsy, and it is unfortunately often fatal. Little is known about its causes apart from high nitrate levels and dirty water, but the use of live foods is sometimes suspected. Because it is more probably a sign of other problems than an individual disease, a sick betta with signs of Dropsy should be isolated in water from the tank before its cause can spread to other fish. Signs include pineconing of the scales, dulled color, sunken eyes, lethargy, disinterest in food, and swelling. The pine cone effect comes from small patches of scales swelling because the fish absorbs water more quickly than its body can eliminate it. Swellings due to Dropsy are most easily viewed from above to distinguish it from typical abdominal swelling, as constipation is most obvious from the side and does not create pineconing. Of all the bacterial betta diseases, Dropsy is likely the most difficult to cure. 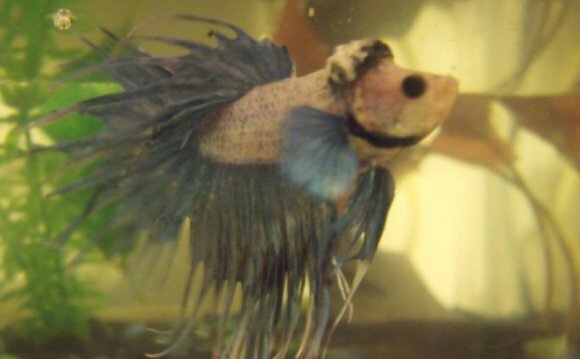 Medicating your betta can be attempted to help eliminate the underlying cause, and salt baths are sometimes instrumental in drawing fluids from the sick betta. Penicilin, naladixic acid, and tetracycline are among the possible medications, as are other antibiotics. Because Dropsy is so often fatal, whether or not treatment is attempted is up to the owner. If treatment is decided against, the afflicted betta should be made comfortable with lowered water level and plants to help give air access. Aquarium salt will help ease pressure and discomfort.